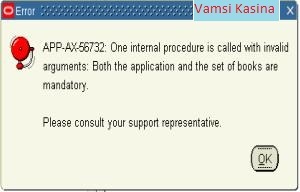 11i - AX - Unable to submit AX Posting Manager/Post Transactions? If the following error occurs while submitting AX Posting Manager/Post Transactions, then set the profile options, AX Application Name and GL Set of Books Name. Which will automatically set the other two profiles. The following are the important profile options, which need to be set to submit AX Posting Manager/Post Transactions.